Work conflicts are a given. And they can be easy to solve. This guide will cover such situations and their respective outcomes. From avoiding to transforming and then winning conflicts. No matter the situation, you stand to gain a lot by being in control. After all, everyone has been in at least one conflict. Knowing what to do when facing one has little to do with experience. And a lot more with being ready. Which is what we will try to solve today. Now, let’s explore each of these methods with great care and detail. By avoiding work conflicts, you save time and energy. And it’s like winning the battle by ensuring it does not take place. While practical, this can sometimes take you to cold war scenarios. And you might actually prefer having had the conflict. Why? Because the first good thing about conflicts is closure. What it means is that having a conflict grants you a finality of sorts. One in which the causes for conflict cease to exist. Meanwhile, avoiding conflicts allows you to better map your surroundings, to understand who or what you’re dealing with; it gives you time to focus on your strategy. Other than that, conflict avoidance builds character. It means you have attained self-discipline. At the very core of conflict avoidance is conflict mastery. And being at your peak in assertiveness when you know you can walk away from a fight. Why? Because you would’ve won that fight. It gives you a wonderful sense of detachment. And compassion. Most importantly, conflict avoidance is something you need to master twice. Firstly, as a work conflict “noob.” Lastly, as a master of work conflicts. Between these two, there are plenty of stages to go through. So let us start with avoiding work conflicts. Here’s how to do it. Never assume anything. Because you know what they say. Assumptions make people something else. So, never assume that you know what or why someone wants to talk with you. And never assume that you know where they’re going with the conversation. People make a lot of assumptions. It is how we function. Our understanding of reality is in itself an assumption. After all, we cannot truly know anything. Hence, we reduce everything “outside” to tiny models we can play with “inside” our heads. And a lot of work conflicts happen because of assumptions. When you assume something, you get tensed up. Ready to respond. Or, even worse, you move for a pre-emptive strike. And oftentimes, it’s all unnecessary. You end up creating a work conflict where there shouldn’t be one. Instead, opt to listen. Try this thought experiment. Observe yourself and your team in the process of making decisions. Notice how many of your judgments come without much informational input? That’s because of how we work. We save energy and use contextual judgments to make decisions. We estimate that our decisions are correct, even when they’re not. And even when given the proof of being wrong, most people refuse to admit it. Apparently, it’s only human to react to truth with disbelief. Most people won’t change their opinion, not even when confronted with facts. It’s science. I was in awe. This is one fundamental truth. We assume everything and know very little. And we can avoid conflicts by acknowledging we assume something and don’t actually know it. It’s very rare that work conflicts happen without reason. Most times, there is a cause, but not a good reason. Without doubt, always pay attention to what might lead to a work conflict. And always act on such causes or issues, without delay. Long before a work conflict rears its ugly head, there are things you can do. Approach the matter, whatever it is. In any case, open up and try and fix it in time. Delaying the resolution of any conflict will result in undue tensions. Undoubtedly people tend to build up on work-related tensions. Similarly, people tend to build up on work conflicts. On the negative side, a work conflict puts both work and interpersonal tensions together. And they add and add, in the same fashion. In time, the imaginary component of a conflict outgrows all reality. And you might feel trapped in a very hurtful imaginary situation. But this goes deeper. When you ignore an issue, you divide your team. And it comes at a great cost. Today, you have to pay with a small discomfort. Taking some time to dismantle an issue. Big deal. Tomorrow, however, you’ll have a full work conflict happening, far beyond your control. And your team will lose unity. One ugly aspect of a divided team is passive aggression. Being slightly ironical and polite while secretly screaming inside. And that list of swearwords that you never let out is like the carving a worm makes inside a perfect apple. Any issue can grow in the absence of communication. All things considered, go ahead and talk about it, at any point. Clear the air. A tiny effort today saves you a world of trouble tomorrow. Without doubt, it helps even when it’s not just your issue. People tend to worry. On average, most people at work are anxious and stressed. In fact, things are so bad that in US alone work stress can kill. It increases rates of heart attack, hypertension and other disorders. While most people (46%) are stressed by the sheer workload, many of them (28%) report “people issues” as the main cause of stress. It makes sense. People issues beat juggling work/personal lives as an anxiety factor. And far too many teams do not use solutions that can instantly enhance their collaboration. So, next time you approach a teammate, explain yourself. State your case in an open, clear and nonthreatening manner. Be open and honest. And tell them why you’re approaching and what you’re hoping to achieve. The other wrong way to start a conversation is ad hominem. That’s what you do when you attack the person, not the argument. Simply never do that. Not only will you hurt another person, but you will diminish your own credibility and reputation. The end result is that you will come across as a bully. And this will happen much before the conflict has even started. What is assumed about you is as correct as possible. The context for the communication is as acceptable as possible. You are well understood and ready to understand. Lastly, making a clear approach preserves your integrity and protects your self-image. With the result that you can open up and not be stressed while doing so. There is only so much you can solve. For one thing, ignoring an issue can later create monsters. Conversely, fighting every battle set in your way will surely exhaust you. By all means, learn to pick your battles. Address only critical issues. To do so, ask yourself how important the issue is. Is it getting in the way of your work? Is it affecting your team? If yes, then go ahead and fight that battle. Don’t tackle all issues at the same time. Instead, focus on detecting support. Try and see how other people feel. And see if your political capital is enough for a swift change. Also, keep in mind that people tend to dislike change, even when change is good for them. Hence, before you go to battle, try and see which issues will have a lot of team support. Make proper use of whatever support you have. Dare to step outside your comfort-circle and find support with others. Be selective in who you share your cause with. The office brawler or the complainer are not ideal partners in this endeavor. Lastly, a team issue is a team issue. Don’t enlist your supervisor. Try and keep it all outside of hierarchical politics. Bottom line, being selective is what nature does. And you should do it too. Suddenly you find yourself in a work conflict, and you realize you don’t want it. Or maybe you started the conflict and it just occurred to you that it’s not worth it. Perhaps you could even win this conflict, but see no reason to push through. Instead, you would rather find a solution to the matter. And that’s a healthy approach. Solutions can come up by bouncing ideas. Sometimes, however, you can’t get others to participate in an open conversation. Not until you get rid of the looming conflict obfuscating team spirits. So, here are 5 ways to deviate from work conflict to open conversation. You can’t be part of a team without having some things in common. Each individual in your team has values, beliefs etc. And each of them has preferences, likes and dislikes. This gives you enough to defuse the conflict and replace it with an open conversation. But it goes deeper than this. Each team member was there to see how you work as a team. Each of them has had the experience of being part of your team. You share the team. That is to say that the team is your common ground, and that should matter. Common ground is useful because it puts you and your opponent in the same boat. A boat that seems to be sinking. Up against everything, confronting the elements. With a storm at the horizon. With this in mind, it should be obvious that any issue is double-sided. Identifying common ground allows you to observe how it affects attitudes. This should make both of you more open to compromise. Or less likely to push fort a personal agenda. Or even a vendetta. In fact, common ground might help you get to the point where you work together to find solutions. Focusing on similitude opens you up. And it’s a cue for the other person. Sooner rather than later, you’re effectively solving your issues. This is the first level of turning a conflict into a conversation. Acknowledging that both of you are part of the same situation. Involved with the same people, trying to work as a team. How to use common ground? Make it evident by saying something like “Steve, we both worked on Project V before we started project X, right?” Or remind them that you are in the same metaphorical boat. And that you need to keep rowing. Imagine being at the receiving end of the following type of communication: “Why are you so mean?” Now, replace “mean” with anything else. There are only a few ways you can react to something like this. And many of them imply being defensive, or fighting back. Either fight or flight. Disarm your opponent with an appeasing question: “Are you perhaps upset with me or is it that I am bothering you in any way?” You will most often get a negative reply. At this point, you should be invited to explain what you mean, which is a great opportunity. “OK, please understand that this is difficult to talk about.” And the tension is already diffused. Now you have a partner listening to what you have to say. Accordingly, use this reaction when prompted to by anyone you think you’re having a conflict with. Certainly, using communication to defuse a work conflict requires a certain finesse. However, there are a lot of technical tips you can use to be an effective communicator. As always, bridging the divide means you get along better. This affects the short-term. It’s a solution to your conflict. But it also affects the long term. Genuine communicators are better at avoiding conflicts. And they are better at being assertive. When we understand something, we have a way of showing it. Our reaction typically reflects our understanding. And even just muttering an essential piece of what we learned is proof enough. Confronting a raging bull full-on means you’ll get damaged head-on. When you make it so that both of you are facing the issue from the same side, that’s a true win. You do this by echoing what you’ve heard. But it also holds true in a physical sense. For example, try and move your body so that both of you are facing the same space. That’s a good way of redirecting negative energy. Call it postural empathy. Either way, we need to show that we understand. And we need to show that we care. And here’s the truth. Tom may not agree with Steve. He may easily be wrong. But Tom can always try to understand. And Tom cannot help but care. After all, Steve is his teammate. They share the same boat and have mutual goals. Even better, for example, you could try something else. Go ahead and ask for advice. There is no better opportunity for a bonding moment. Well, at least considering the circumstances. Emotions are tough to manage. Particularly at work. You’ve had a long day. And plenty more to do. And now you certainly don’t feel like having someone shout at you. Or worse, you feel like you could shout at someone. Either way, hold it in. 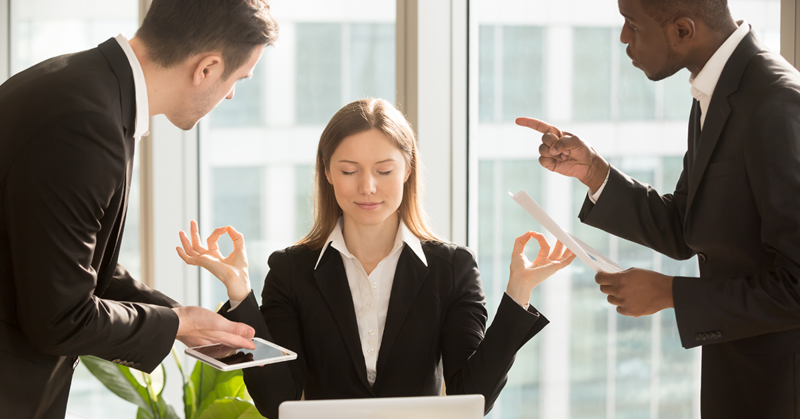 One clean way to manage your emotions at work is to keep yourself centered. To do so, simply focus on your breath. Markedly odd, this mindfulness exercise caters for calmness and clarity. Not to mention that you can further develop this into a whole mindfulness practice. Another way is to work a great deal on staying in contact with your emotions. Culturally, we aren’t doing that well with emotions. We’ve been taught to repress some, or all emotions. To stay calm at all times, it’s best you develop clarity about your context. No amount of conflict should disturb you. No amount of shouting or angry lines of lies. To put it differently, you should focus on feeling calm and still. And no reason to feel anything else other than compassion. Your coworker is having a tough day. And they are trying to share that burden. Unfortunately, they do so without much control or regard for how you feel. While you may feel compassion, try to keep your bubble of self-control intact. Why? Because no one has the right to disturb you from this bubble. Not at work, anyway. The results will soon follow. Out of steam, your irritated teammate will be mesmerized by your calmness. At this point, you can try and put to good use all of the tips in this article. At any rate, you should be able to calmly solve the issue with conversation. With the result that it benefits both of you and the team as a whole. We’re talking about this now because it’s so hard to do. And even though you know it’s the right thing to do, it’s still hard. “I misunderstood, it’s my fault…” This is OK.
“While I might have misunderstood… “ This is NOT OK.
“I misunderstood, it’s my fault but…” This is NOT OK.
“We’re both wrong about this. Let’s find a way for both of us to be right…” This is OK. Overall, saying sorry is difficult. Undoubtedly it is very easy to say sorry and not mean it. Apologizing as a formality is something we learn and practice for a large portion of our childhood. For that reason, our apologies might often seem not genuine. By the same token, truly saying sorry is even tougher. And there’s no guarantee that people will believe you. Under these circumstances, do your best. In the hope that your teammate will understand your endeavor. Work conflicts can make us productive. We can thrive on work conflicts. Of course, it’s great we talked about how to avoid them. And that we know so many ways to defuse them. Here’s how to turn work conflicts into constructive outcomes. Want to win a work conflict? Start by setting the right definition for winning. To win a conflict, you need to have your moment. Have your side presented. Even if your point is not winning argument, it doesn’t matter. Winning a conflict means that everyone knows what you have to say. That you write your own narrative. After all, it’s the winners that write history. And you can’t win a conflict if you avoid it. People that are prone to avoiding conflicts end up building up tension. In this case, they become passive-aggressive, frustrated, unhappy. Be that as it may, people who love conflicts also suffer. Explicitly, they are deprived of having their share of conflicts. Or they end up winning conflicts far too easily. In this situation, they are left unsatisfied and conflict-hungry. As a result, they start looking for conflicts where there aren’t any. Either way, the outcome is not optimal. Surprisingly, it all starts with people that are conflict averse. And we live in a conflict-averse society. We need to repurpose conflict-avoidants and help them take part in some well selected conflicts. Here is a fair warning. Conflict-avoidants are very numerous. In fact, most of us would rather avoid conflicts. From early on, we are taught that the civil thing to do is not to fight. “Be agreeable.” “Make yourself liked.” “Don’t start a fight.” No wonder we have so little practice in being in a conflict. Staying away from fights does not resolve your tensions. What you do is that you store those tensions, and later you let them punish us. By not resolving things on the way, you end up hurting yourself. You should watch yourself in a hostile context. When your main focus is getting away from that situation. Or when you feel scared of failing set expectations. Because that’s when you put on the passive-aggressive coat. Admit it when something bothers you. Constantly minding others gives you no place in your own mind. Conflict-avoidants clearly know what they want and how to say it. However, they’re not sure if they should say it. In truth, conflict avoidance stunts our growth. We are pretend-peacemakers. Instead of mastering conflicts to become avoidant, we run and hide. This has to change. There’s the issue of being assertive. A lot of people find it difficult to be assertive. There’s the issue of authenticity. And despite loads of training, some people cannot be genuinely assertive. Conflicts are not easy to deal with. And it is tough to manage yourself while also managing a conflict. Yet, to the core of this issue is mindfulness. We often lack the perspective that others seek different outcomes. While we detest meetings, our boss might be thrilled to have one. So, naturally in a conflict, we are unprepared. We do not “know the enemy.” Nor do we know who our conflict-partner is. We merely assume, and that’s often wrong. And we push when we should not. Or we give in when we should not. Oftentimes, this feels like a transaction. Yet, we fail to be productive in this agitated negotiation. Why? Precisely because we do not know ourselves and others. Morally speaking, standing up to conflicts is not the wrong thing to do. We should, by all means, stand up for ourselves. And for what we believe in. We should stand up for our work, our opinion, our way of life. But this is balanced against interpersonal understanding and compassion. Not sure what to do? Pick your battles. Or avoid conflicts altogether. Feel like you want to win the conflict and need to know you should? Read below. The solution is being assertive while conflicts happen. And you can do this with a few key tips. Take a small break. All things considered, allow yourself to relax. And let your mind wander off for a bit. Yes, you are currently locked in a conflict, and that’s OK. Conflicts happen because people are misguided. All in all, you need to clarify things. Ponder on the root of the problem. And on what generates the conflict. It could well be that you have a different point of view. So different, in fact, that it clashes with your colleague’s. Are you friendly, yet firm? Are you angled in a way that depicts an open, genuine person? Great. Let’s go straight to content. State your opinion as well as possible. Example: “I think that we need a different solution…” Now, you will soon discover if there’s something you’ve misunderstood. If you have, you should apologize for the confusion. There are fewer future conflicts when people know how to apologize. Always thank your interlocutor. Thank them for the conversation, for an explanation. In fact, request as many explanations as possible. It’s the smart people that ask loads of questions. Take yet another moment to ponder. This time, post-conflict. Lean on what you enjoyed the most about your communication. Review your performance. Try and figure if there is anything you can use to make the most of a similar conflict. The future will not give us a workplace without work conflicts. They are here to stay. It might take a global educational breakthrough to change things. Until then, all we have is the status quo. We have explored three ways in which to deal with conflicts. We now know how to avoid them before they happen. And we know what to do once they start. There is so much room for improvement in both regards. Lastly, we learned a great deal about why we avoid conflicts. With the result that we now know how to be more assertive. In particular, we know it’s OK to partake in a conflict once in a while. Not to mention that we need to be equipped for either peace, diplomacy or war. Above all, we now know that we should adjust our reaction to the setting. And properly manage our behavior. Conflicts are often spontaneous and may catch us off-guard. Hence, professional help always happens too late: after the conflict and not before it. Granted, coaching and training may improve everyone’s ability to deal with conflicts. However, it is how we react in the moment that makes a great deal of difference. With this purpose in mind, there is a great deal to be said about self-improvement. Mindfulness practice, in particular, is key to controlling any conflict situations. To put it all in one sentence, nowadays work conflicts are a skill.